Dr Janetius. S.T., Shilpa. S. & Eswaran. S.
The mushrooming colleges all over India both in metropolitan cities as well as semi-rural towns have changed the outlook of young people and their vocational preference significantly. Unlike a few decades ago when only economically well-off adolescents generally opt for higher education in the metros and institutes of reputation, today’s youth venture in to higher education irrespective of their economic background. Thanks to the government policy that started in the last decade for easy accessibility of educational loans, students started to seek funding for their higher education from external sources, like government and private sector banks. The increased number of students in search of degrees paves way for the rapidly escalating number of educational institutions with poor infrastructures, undeserving and unqualified candidates as faculty members and inflated tuition fees. These in turn contribute to the bigger number of unskilled graduates ultimately ending as loan defaulters. Since loans up to Rs4 lakh do not require collateral pledge, defaulters have been on the rise and it is hard for the Banks to recover educational loans amounting to higher bad loans or non-performing assets (NPA). 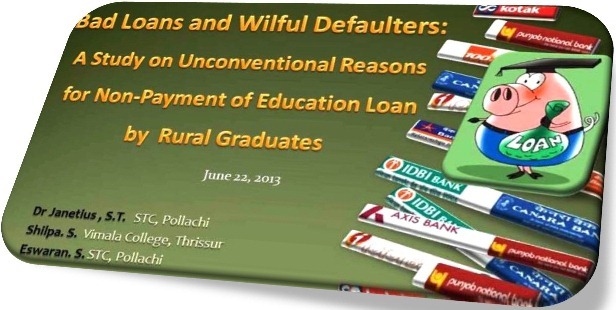 The study identifies three categories of wilful defaulters each with specific reasons for their non-payment of loans. The third category - defaulters of unconventional reasoning get their thought pattern and attitudes from their parents who are mainly farmers. Majority of the subjects are coming from rural agricultural families and they are familiar with the loan-waiver schemes political parties announce in their election manifesto or during budget presentations. In the recent times, P. Chidambaram, Finance Minister of India, announced a relief package for farmers in 2008 called the Agricultural Debt Waiver and Debt Relief Scheme beneficial for nearly 30.7 million small and marginal farmers (The Hindu, 2008). Similar schemes have been announced by state governments too. Therefore the mind-set of the rural younger generation is filled with expectations of freebees, loan-waivers and relief packages to pay-off the loan. The loan-waiver schemes have created a poor financial management schema among the educated rural younger generation that needs a change.